The only effective replacement for ordinary resin in orgone devise is sugar because it has the same similarities to chimical components. Mix all the food ingredients in a saucepan. Bring to boil, and with a thermometer to verify the temperature of the mixture, that must attain 320 oF, or 160 oC (watch out not to surpass this temperature otherwise the mixture will burn). It is absolutely necessary to avoid mixing during the whole heating period. After the temperature is reached remove from heat, let it stand for a few seconds before pouring into jars, add metal, spirals and or crystals. Mix well. Leave to dry for a few hours and seal the jars or varnish the forms if you do not wish to use containers (this has not been tested very often). 1 Francis was telling me that he now poured the sugar in the jars before he incorporated the metal, which works better to mix the content, this is the best way we found. NEVER PUT THE METAL BEFORE THE SUGAR IN THE JARS, especially in the spice jars , cooked sugar being too thick it does not pass through the metal shavings. 2 Ideas recommended by Ma-ra on the forum, leave the mixture to soak at least 24H before cooking, that will lower the cooking time by half, ideally, obtain a 2 or 5 gallon barrel which you can get in any restaurant for free. Fill it with the sugar mixture and let stand. Before cooking, it is important to mix the ingredients well. For a replacement to the Tb, spice containers available at most dollar stores normally at 3 for one dollar . I found them very effective and they are practically unbreakable, one can launch them outside the car on the expressway without problems. To seal the containers I use a hot glue gun, this is the cheapest and most effective way that I found. One can also use "Goop Glue" or silicone to seal their containers. 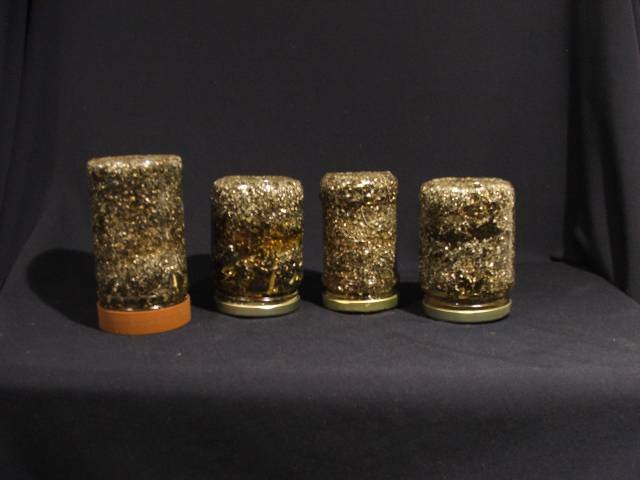 Here are some sugar orgone devise.